"Submission to the Legislative Council Social Welfare Panel's Subcommittee on Strategy and Measures to Combat Domestic and Sexual Violence"
1. Set up a multi-agency response network with regular cooperation between police, health services, legal profession, government agencies and NGOs for each case to improve the quality of domestic violence services for ethnic minority victims. This would obviate the need for victims to repeatedly tell their stories and would also save resources and time, particularly where interpreters and third party interveners are necessary to come to a comprehensive view of the situation and conduct risk assessment. 2. Set up and implement a uniform and coordinated data intake and collection process to record disaggregated data and allow for a systematic review and evaluation of the patterns of help-seeking, follow up and service provision on an ongoing basis. This would assist in informing strategies for intervention to ensure their suitability in cross-cultural settings. 3. Mandatory and Regular in-service training for front line responders, including the police officers, lawyers, healthcare professionals, social workers and other service providers, in human rights and cultural sensitivity to ensure that knowledge can be harnessed and applied when handling domestic violence amongst ethnic minorities. 4. Review the quality and impact of existing materials.The experiences shared by the ethnic minority women in their encounters with frontline staff and respondents and the interviews with frontline responders revealed that some of the materials used in cultural sensitivity training contain harmful and negative stereotypes about ethnic minority and immigrant women. 5. Establish a one-stop shop service centre in the long run for ethnic minority and immigrant women, to improve cultural intelligence and competence to handle the needs of ethnic minority victims and empower them in terms of financial independence, literacy, vocational training and social integration. 6. 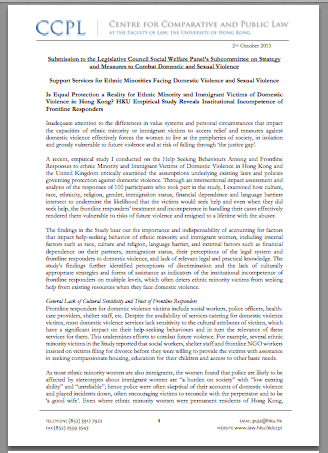 Establish specialist agencies for the intake of ethnic minority and immigrant victims of domestic violence, such as those in place in United Kingdom.